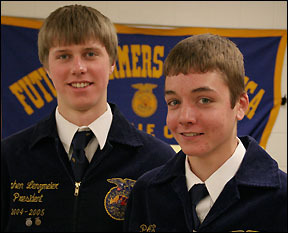 Seniors Adam Flanders and Stephen Lenzmeier have become the first FFA students at Paynesville Area High School to earn their state degrees in 24 years. The state degree is the third rank in FFA (Future Farmers of America) and the highest available in high school. According to school records, Flanders and Lenzmeier are the 26th and 27th local FFA members to earn their state degrees and the first since 1982. This year, seniors Stephen Lenzmeier and Adam Flanders became the first PAHS FFA students to earn state degrees in 24 years. For the award, they had to document their FFA experience and their farm work and display their general ag knowledge. There are four levels in FFA: greenhorn, chapter, state, and American. Both Flanders and Lenzmeier said ag teacher and FFA advisor Natalie Todnem pushed them to get the greenhorn and chapter degrees. Then they got motivated to pursue the state degree. To get the state degree, they had to submit their FFA records for grades 9-12 as well as their records of farm work and skills. They also were interviewed at the regional competition in February and asked about these records, about their general farm knowledge, and about their knowledge of FFA, including parliamentary procedure.
. Lenzmeier served as the local FFA chapter president for two years and Flanders as vice president, before they both decided not to be an office this year. Both plan to study agriculture or a related field in college. Adam plans to attend Ridgewater College and study ag business, and Stephen plans to attend the University of Wisconsin-River Falls and study either ag engineering or another ag field. But neither is sure they will pursue the American degree through college FFA. State FFA will be held on Sunday, April 23, and Monday, April 24, at the University of Minnesota-St. Paul Campus. With their state degrees, Flanders and Lenzmeier automatically get to attend. They also earned state trips by placing fifth and third respectively in the regional dairy production placement competition, which also involved their farm records, time cards, job duties, experience, and skills. Three Rocori students take ag classes at PAHS and participate in FFA at PAHS, and they also placed in the regional dairy competition in February. Senior Nikki Meier took first in dairy production placement at regions, and juniors Leah Molitor and Ellie Opitz placed second and third in dairy entrepreneurship respectively. The PAHS horse judging team - ninth grader Mary Herding, ninth grader Emily Lieser, sophomore Kaitlyn Frenchick, junior Brittney Spanier, and senior Caitlin Lien - qualified for state FFA last fall. These five students will compete in region dairy judging on Tuesday, April 4, in Fargo. 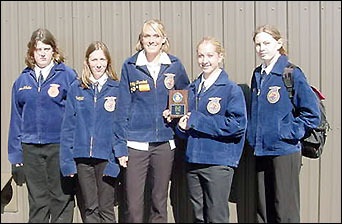 PAHS's FFA horse team - sophomore Kaitlyn Frenchick, ninth grader Mary Herding, senior Caitlin Lien, ninth grader Emily Lieser, and junior Brittney Spanier - also have already qualified for state FFA, placing in the regional horse judging in October 2005. Spanier placed second individually, and Frenchick third.